I don't know about all of you, but I have a wine storage problem. And no, it's not because my state of the art wine cellar is overflowing. (Don't I wish.) It's because my winey little wine rack can only hold bottles of a certain sized bottom. I will now direct you to the actual, unretouched photo of my wine rack, below. You can clearly see the oversized bottles standing next to it, not laying in it. It's not that we trip over them (although one of the Winey Doggies has taken to pawing at the large green bottle..not sure if she is asking for a sip or she thinks it's a doggie toy) it's just that it looks messy. And bottles should be stored on their sides. I want my wine to be well rested when I open it. This is not to disparage my wine rack. I love it. The Winey Hubby and I found it on a trip to one of our all time favorite places ever: Niagara On The Lake, Ontario, Canada. If you are ever able, get your winey self up there! Not only is it a charming little English cottage town sitting right at the end of the Niagara River and the beginning of Lake Ontario, it is smack in the middle of Niagara wine country. Wineries galore, as a matter of fact!!! And the shopping!!! Makes my winey heart go all aflutter. Everything from Christmas stores to gourmet foods to English wares to antiques. And it was in one of these little antique stores that we found our piano themed wine rack. It's not an antique, but we are a music loving family, so we couldn't resist it. 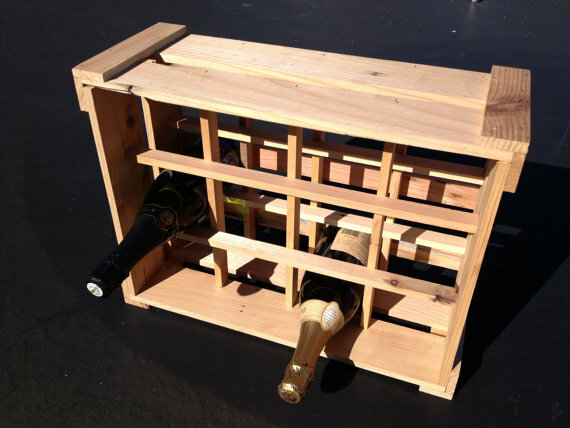 But as with many wine holders, this rack is set up to hold bottle of a certain size. So forget the big bottomed bottles that hold champagne or sparkling wine or even a litre and a half (don't smirk, you know you buy them). Granted, this is not as big a problem as say, the large colony of bees who have taken up residence in our patio light fixture. Nevertheless, I was intrigued when the folks at ThinkEco2 contacted me and asked me to take a look a their shop (on Etsy). A little background first: Jules Lavallee and Brian Behncke are the brains behind this eco-friendly company in San Diego. 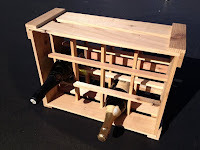 Brian is the construction guy, and he takes old cedar wood and turns it into wine racks, wine gift boxes, garden products, and patio furniture. (They caught my eye at "wine racks".) So I decided to take an online stroll through their shop and lo and behold, I found the answer to my big bottom bottle problem! 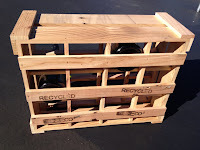 A wine rack made especially to house those oversized bottles! 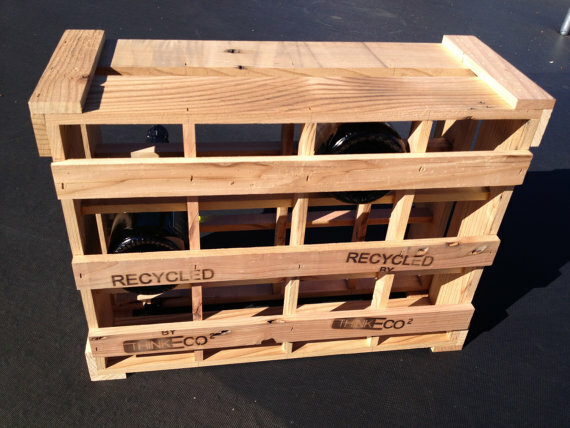 It's made of 100% reclaimed cedar wood and is meant to sit on the floor. I love the rustic look. (It would fit right in the Winey Family kitchen decor, since I have decided that sleek and modern is not my style as much as French country/US teenager applying to college clutter is). And as an extra special treat, ThinkEco2 is going to give us all a $10 discount on our orders. It's only good for one week, so check it out today! Simply enter the code wineymom1 when you check out. And for those of you who are Etsy fans out there - let's start a list of some of our favorite Etsy stores. Just list them in the comments and maybe, just maybe, some of us can start shopping for the holidays a bit early!!??? I also have a problem with this before so I bought a wine rack holder so I can arrange it in a good way. 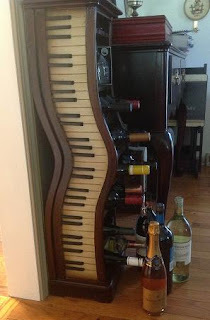 That wine holder with piano design looks cool. Your comment will appear as soon as it is verified! Cheers!